SeptemberGrams – My favourite Instagram posts from September 2014. Follow my Instagram account for these and more fun pics. This past weekend marked the beginning of the Savour Cowichan Festival in Vancouver Island’s beautiful Cowichan Valley. With 40 artisan food and beverage producers participating it will be an incredible 10 days of tastings and special events in the Cowichan Valley. The event runs from September 26 to October 5, 2014. This past weekend I had the pleasure of visiting some of the participants, one of which was Cherry Point Estate Winery. Cherry Point Estate Winery is located in Cobble Hill, BC on Cherry Point Road (see map below). Tours are available year round but must be booked at least 48 hours in advance, and take about 45 min to complete. The tasting room is open every day from 10am to 5pm giving you an opportunity to sample their award winning wines. This 2009 Pinot Noir is produced from a single vineyard block that was carefully tended to during the spring to ensure early ripeness. This wine was aged in old oak barrels for 10 months and has big cherry aromas with hints of raspberry and undertones of clean cedar. A silky mouth-feel is brimming with cherry, strawberry and raspberry flavour notes. A perfect wine to pair with smoked salmon, roast beef or any favourite west coast dinner. A delicious blend with aromas of orange blossom, wild blackberry and spice. Juicy dark cherry and black current flavor notes with a kiss of oak are followed by a peppery, berry finish. Food friendly wine, ideal while picnicking al fresco, barbecuing or just sipping on the patio. 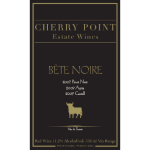 Our Bête Noire is a cross varietal, cross-vintage blend of our better vintages and a wine representative of soils and climate which are unique to Cherry Point. Pinot Noir 2007, Agria 2009 (the true black beast) and Castell 2009 have been crafted together to create a wine reminiscent of the Rioja region in Spain. Rich red in colour, an earthy nearly dusty aroma introduces the wine followed by plum and spice with a savory oak finish. ThisBête Noire has a great backbone; perfect pairing with steaks and mature cheeses. 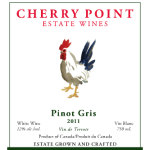 Cherry Point Estate Wines premium red wine is made with the best performing Castel, Agria and Zweigelt grapes. Forte is aged in old French oak barrels for 18 months giving the wine a supple velvety texture. This wine is dominated by a cherry aroma, with hints of plum and raspberry. The full-bodied fruity taste is suitable for pairing with all red meat dishes. Pale yellow with a lovely citrus fruit and spicy bouquet, juicy pineapple, mandarin orange and pink grapefruit flavor notes on the palate, with a long honeyed finish; Delightful with poached salmon and white sauce, pasta primavera and crisp shavings of Parmigiano Reggiano from Italy. Bronze Medal, Northwest Summit Competition. This Germanic style blend of Pinot Gris, Siegerrebe and Sylvaner has a light straw hue and aromas of honeysuckle and fresh citrus fruit, pear and orange flavor notes are followed by a long crisp finish. Ideal for summer sipping or as an aperitif. Great with seafood, poultry and Asian dishes. This stylish aromatic white has subtle tones of lychee and peach on the nose with floral undertones and a crisp grapefruit finish typical of our terroir. This Cherry Point classic is pale straw in colour and displays aromas of grapefruit and apricot with underlying floral notes, typical of the varietal. A full palate of ripe peach lingers with balanced acidity. Pairs well with risotto, pasta and chicken. The winery is located at 840 Cherry Point Road in Cobble Hill, BC. For more information visit the Cherry Point Estate Winery website and/or follow them on Facebook. Nitinat Lake is considered to be the jewel of Vancouver Island for kiteboarding. It is an ideal place for both novice and expert kiteboarders to practice their skills. Nitinat Lake is a tidal, saltwater fjord, 23 km long and 1.2 km wide. The southern end of the lake lies in Pacific Rim National Park Reserve, which also includes Nitinat Hill on the lake’s northern shore and Nitinat Cone on the southern shore. The wind on the lake picks up around 11am – 12 noon and brings great conditions for both kiteboarding and wind surfing throughout the day. The windy season at Nitinat (also known as Nitnat) Lake runs from May through September with the windiest months being July and August. During these months a normal day will deliver thermal winds in the perfect 18-20 knot range, and then slowly dies off in the evening. For weather and wind forecasts, visit Windfinder.com. Every summer Nitinal Lake hosts the Windfest kiteboarding competition which attracts kiters from the USA, and more recently the world. For more information visit Windfest.ca. Access to Nitinat Lake is by gravel logging road via Lake Cowichan/Youbou. It’s approximately 3.5 hours from Victoria and 3 hours from Nanaimo, and 2.5 hours from Duncan. Make sure your vehicle is equipped to handle the dirt roads, as they can be slippery and riddled with potholes. The Nitinat Lake Recreation Site provides rustic camping, managed by the Ditidaht First Nation. If you’re lucky, you’ll get a spot right on the lake. The campground provides picnic tables and fire pits at $12.00 – 14.00/night – although no one came around to collect fees when I was there. There is no cell service, no running water and no power at the campground. Pack out your garbage when you leave, there is no disposal services. There are outhouse facilities, but it’s a good idea to supply your own toilet paper, as they tend to run out. Evening temperatures can vary during the summer from cool to tropically warm. Be sure to bring enough blankets for those cooler nights. During the summer months, there is a good chance that there will be a campfire bans in effect. The alternative to camping is the Nitinat Lake Motel. Room prices ranging from $65 – $100/night. For information and reservations, call 250-745 -3844. For more photos from my time at Nitinat Lake, please visit the set on Flickr. AugustGrams – My favourite Instagram posts from August 2014. Follow my Instagram account for more fun pics. The Cobble Hill Fair celebrated its 105th year this summer and the 4-H Club celebrated its 100th year in BC. If you missed the fair this year, be sure to keep an eye out for the 2015 fair date! JulyGrams – My favourite Instagram posts from July 2014. Follow my Instagram account for more fun pics. In the past few weeks we have covered camera setup and shoot planning, exposure and camera settings, and focusing and sharpness. Today I’ll be sharing some lighting and colour tips to help advance your photography skills even further. Take Advantage of Cloudy Days – You don’t need to wait for a sunny day to go out and shoot. Cloudy days are great for portraits, macro and even some landscape situations. The cloud provide a natural diffuser to the sun’s bright light and help eliminate harsh shadows. Shoot Into the Light – Don’t always shoot with the sun behind you. Experiment with shooting into the light for some interesting images. Try to position the sun (or light source) behind your subject to help minimize flare. Shoot at the Golden Hour – The golden hour is one of my favourite times of day for shooting. The golden hour is the period shortly after sunrise or before sunset during which daylight is redder and softer compared to when the sun is higher in the sky. At these times the light is much warmer and you will get much better colour. You will also get some interesting shadows and textures. Use a Reflector – A reflector can help you fill in shadows by bouncing light back into the darker areas of your image. If you don’t have a proper reflector, you can use anything from a white piece of paper or poster board to a sheet of fabric like a t-shirt. Experiment With Fill-In Flash – Use your camera’s built-in or external flash to lighten shadows when the sunlight causes dark shadows on your subject. Use a Diffuser – The sun can produce some pretty harsh shadows when it’s high in the sky. Experiment with placing a diffuser between the light and the subject to soften shadows.You don’t have to spend big money on an expensive light diffuser, you can easily make one yourself out of a piece of white cloth or paper. Shoot at Night – Night photography is where I’ve produced some of my favourite images. Experiment using long exposures and other lighting techniques like light trails and painting with light. Be sure to bring a sturdy tripod and remote shutter release to help capture sharp images. Play With Your White Balance – It’s easy to set your camera to automatic white balance, but the auto setting can be fooled in lighting some situations. If you’re shooting in a mixed lighting setting, try shooting a white or grey card and use this to help you learn about and set your custom white balance. Remember that as long as you are shooting in raw file format, you can always adjust the white balance with your software in post-production later. Shoot at Twilight – Just before sunrise and just after sunset are great for capturing some moody landscape images. It’s also a good time to catch street scenes and cityscapes while the sky has a bit of light yet you still capture the city lights. Try Shooting In Black and White – I’ve found that I don’t shoot much black and white since the emergence of digital photography. It was far easier to do when you used a roll of black and white film in your camera. But harsh sunlight can produce strong shadows for some interesting high-contrast back and white images. Try it! Do you have any colour or lighting tricks to add? Share them in the comments below. Next week I’ll share Composition and Creativity Tips. If you found this article useful, please share it with your friends via the social media buttons below. In the past couple of weeks I’ve shared some photography tips with you relating to camera setup and shoot planning, as well as exposure and camera settings. Today I’ll be covering 10 focusing and sharpness tips to help improve your photography even more. Hold the Camera Properly – Hold your elbows close to your body and hold your left hand under the lens. Release the shutter just after you exhale to help hold the camera steady and minimize camera shake. Focus Your Viewfinder – Most DSLR cameras enable you to adjust your viewfinder for your personal eyesight using the dioptre adjustment dial. Make sure you adjust this to ensure you can see your subjects clearly through your viewfinder. Set the Right Focus Point – Set your camera to single-point AF mode, rather than letting the camera choose the focus point automatically. You can then position the active point on the subject that you want to be sharp. This is very useful when the main subject is not right in the centre of the frame. Use Focus Lock – Use this when your subject is not right in the middle of your frame. Position the subject in the middle, focus on it, use the focus lock and then re-frame the shot. Pre-Focus – If you have a moving subject and can predict where it is going to be, pre-focus on that spot to make capturing a great action shot easier. Shallow Depth of Field – A shallow depth of field (or wide aperture) to blur the background can make your subject appear sharper than when your whole photo is sharp. However, you should avoid using very small apertures unless you absolutely have to because lenses produce softer results at f/22 than at f/8. Hyperfocal Focusing – To get the full scene sharp with a wide angle lens, you should focus around one third of the way into the scene with an aperture of f/16. Focus on Eyes – The eyes are usually the most important feature of a portrait, so make sure you focus on eyes of your subject. This is especially important if you’re shooting with a shallow depth of field and wide aperture. Use a Tripod – This is the best way to ensure sharp images, especially when shooting at long shutter speeds. A monopod may be a better option for action shots to minimize camera shake but still move around fairly easily. If you don’t have a tripod or monopod, brace the camera on a solid object like a post or a wall. When all else fails you can kneel or lie down to create a more stable position. What focusing tricks do you use to get super sharp images? Please share in the comments. Stay tuned next week for lighting and colour tips.